We all rely on small businesses to help make our holidays special, and we rely on the Internet to help us find the right local spots. Is your business ready to connect during this busy time of year? In the next few weeks, Google and our partners are bringing hundreds of local workshops to a city near you to help your business get ready for the holidays. On October 26th, we’re also hosting a live workshop online with the U.S. Small Business Administration. Join us to learn how to create a free business listing on Google, optimize your website for mobile, and advertise online. Tune in on Wednesday, October 26th at 10 AM PT/1 PM ET to watch the livestream. We hope to see you there. And from our team to yours, happy holidays! 1. Ipsos MediaCT, Google Post Holiday Shopping Intentions Study, January 2015, n=1,500. Since 1992, Werkheiser Jewelers has been helping customers find the perfect holiday gift–from picking out an engagement ring to restoring cherished family heirlooms. While they’ve kept their love for tradition alive, the way they do business has changed with the times. despite the wide range of educational materials available – sometimes “more” isn’t the same as “better.” You’ve told us that you want quick, bite-sized training in more interactive formats. And we heard you. 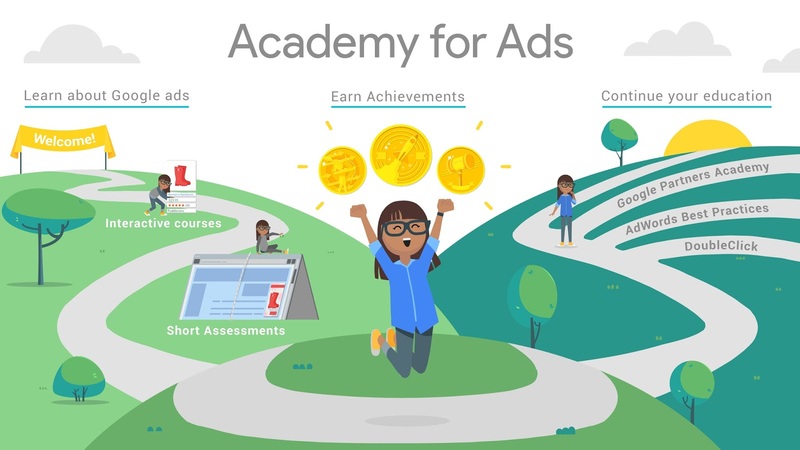 We’re pleased to announce Academy for Ads, a new digital training platform designed to help you learn how to use Google’s ad products in a mobile-first world. We built Academy for Ads to promote learning on-the-go, whether you’re on a laptop, a desktop, or a mobile device. Guided by input from our team of product experts, Academy for Ads courses cover the topics that matter most to Google advertisers – from AdWords basics and the essentials of campaign management to bid strategies, reporting, optimization, and more ways to successfully advertise with Google. We’ve organized the courses into “Learning paths” that you can walk through at your own pace. At the end of each path, take an Assessment and earn an Achievement to show that you know your stuff. Earning an Achievement for AdWords helps prepare you to take the AdWords Certification exam in Google Partners, or try deeper education offerings such as AdWords Academy. Digital concepts: Learn the essentials of online ads, including third-party ad-serving, programmatic buying, remarketing, and more. Get started with AdWords: Learn the basics of AdWords and prepare for the AdWords Certification exam offered by Google Partners. Get started with AdWords Display: Learn how you can show ads to your online audience via the Google Display Network. Academy for Ads also offers training for DoubleClick clients, with Learning paths covering Bid Manager and Ad Exchange – and more to come. If you already use Google Partners, you can sign in through the Partners portal at g.co/learnwithpartners — or, you can go directly to g.co/AcademyforAds to sign up and start sampling courses and Learning paths. We’re constantly adding more content, so if you like what you learn, keep coming back for more. Becoming a digital advertising expert takes time, and it’s important to get off to a good start. Only 50 percent of marketers say they’re confident in their knowledge of digital advertising,1 despite the wide range of educational materials available – sometimes “more” isn’t the same as “better.” You’ve told us that you want quick, bite-sized training in more interactive formats. And we heard you.